Today we had James Tennison, Don Ivan Punchaz and Jose Cruz. Everyone is settling into a rhythm. I guess the universality of being drenched by the rain--leveled everyone. It is cool...my guess, cold for Texans (55˚). So we northerners pulled out the layers of wool and scarves. And so, we began with James Tennison. James is a very skilled, elegant man who is well suited to his profession and will continue to grow and achieve as his work and his personality are so perfectly joined. He has a gentle spirit with a nice sense of humor and an ability to clearly sum up his work, impressions and ideas in a way that is not artsy or scarey--but appropriate and right. He is inspired by some of the best, yesterdays Bart Forbes and Joe Bowler in his work. He has a fairy godfather, Tom Beard, who has made opportunities happen and has coached and encouraged James in his work. But James is also very salient in his saying "Mothers talk" referencing the strength of the personal commendation in his portraiture. I think that goes beyond the portraits and may pertain to all of his work. He gives everyone their due, but it is his work and his sheer pleasure in the entire process around the development of the image, meeting of his subjects and the actual putting paint on canvas--it is a delight to him, and it shows. 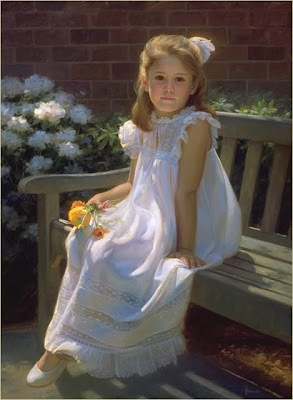 Joe Bowler told James Tennison that he "needed a picture of a little girl in a white dress"...."that would keep him busy". Tennison credits this picture as the picture that launched his portrait career. 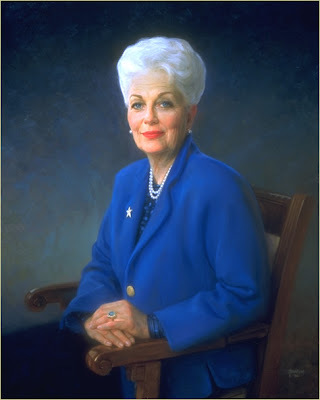 He has done lots of little girls in white dresses, their moms in black dresses, curates in ecclesiastical robes, important men and one woman governor, Ann Richards(see below). James was very funny in talking about the fun working with Ann Richards saying " with Ann Richards...in Austin...its like you are with Elvis". Richards sat for his portrait and photographs as well as for a color study (which Tennison does both with portraits but also landscapes as he feels it allows him to more genuinely feel/ know the image which I can understand...it personalizes it and to me, gives it more heart). The former governor offhandly said that now that George Bush had won the election, she had plenty of time to sit for the artist. Every opportunity for James Tennison is a chance to make a contact, a friend and connect with the next painting. He completed a wonderful job from a picture of a young man in an airplane hanger with a fighter plane (jet/stinger maybe(?) with lots of grit and dust realizing that the requestor was connected to a strong and wealthy family that could create more opportunities for paintings, people and relationships. He is very smart with these connections and seems to have a great deal of discretion relative to privacy etc. He also has a "tipping point" contact in Tom Beard--someone who knows a range of people and connects people with opportunities. "Vinnie" as Beard calls Tennison (after Vincent Van Goph) is being connected with people here and Europe. 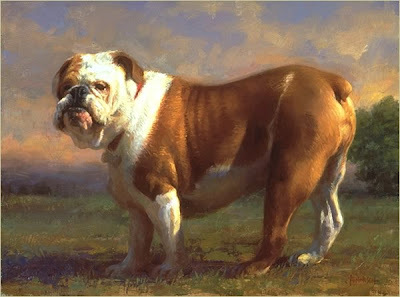 Beard has hired him for personal portraits of his family and his delightfully painted bulldog (see below)--How supremely english is this picture?! I love it. James Tennison balances his portrait work with subjects that speak to his pleasure in architecture and landscapes. "I love white". "If I can capture sunlight, I am perfectly happy with that." I think that James Tennison is a kind and lovely man and his work reflects his clearsighted ability to visualize his subjects with integrity, honesty and for the good.